Investment policies in Sri Lanka have to be further restructured to attract more Foreign Direct Investment (FDIs), Chairman, International Chamber of Commerce of Sri Lanka (ICCSL), Keerthi Gunawardane told the 49th Annual General Meeting and 60th anniversary celebration of the ICCSL in Colombo on Thursday. “The ideal solution for Sri Lanka to increase the overall amount of foreign direct investment is to focus on improving the environment for investment by implementing coherent and consistent policies. 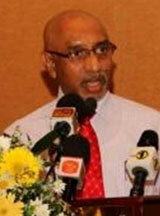 Without coherent policies, Sri Lanka will continue to struggle in attracting good FDIs,” he said. “If that happens, we are likely to be rewarded with increased investment and we will a have the opportunity to develop our industry faster. The ICCSL will play a crucial role as a facilitator to create the much-needed business links with potential entrepreneurs at home and abroad,” Gunawardane said. He said that Sri Lanka and China should work closely in the future to better reap future growth targets set by the government. ICC has been a pioneer in the fight against corruption, issuing in 1977 its first version of the ICC Rules of Conduct to combat Extortion and Bribery. ICC is on the forefront in the development of ethics, anti-corruption and corporate responsibility advocacy codes and guidelines, providing a lead voice for the business community in the rapidly changing world.The ICC Rules are a method of self-regulation by international business and constitute what is considered good commercial practice in fighting corruption. The ICC Rules on Combating Corruption respond directly to the G20’s call and to UNCAC’s need that business step up its efforts to fight against corruption. The International Chamber of Commerce of Sri Lanka (ICCSL) is the national body representing the International Chamber of Commerce (ICC), the body that speaks with authority on behalf of enterprises from all sectors in every part of the world on international trade, investment systems and market economy.